The Payboy software allows for flexible shift scheduling and simplifies the process of creating shifts and allocating employees to them. This guide will detail the various functions which can be done on the shift scheduling module. 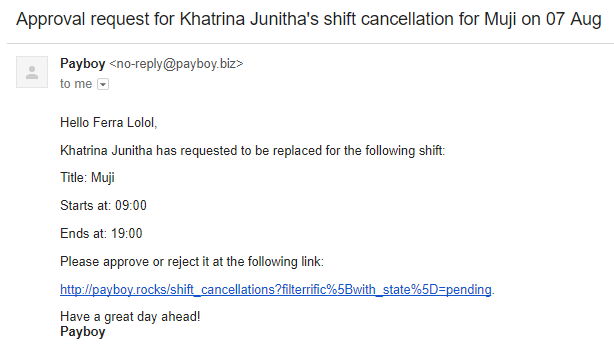 When your employee has sent a shift cancellation request, you will receive an email notification. Open the email and you will see a link which will direct you to the page where you can make your approval decision. You can choose to either Approve or Deny the shift cancellation. If the shift cancellation request is denied, it cannot be re-applied for. Scrolling over the name icon of the employee who is allocated to the shift will show a red 'X'. Click on it and the employee should be removed from the shift. Drag and drop another employee onto the blank space to allocate him to the shift. Publish the shifts so that it can be formalized and the employees will be notified.